In November of last year, the Universidade de Pernambuco (UPE) held an election to select the next Director of the Petrolina campus. The position had been held for the last 16 years by the outgoing Director Maria Socorro Ribeiro Nunes and her sister, who had been trading the post back and forth to meet the term limit requirements. This election was different for two reasons. Primarily, it would be the first election after a 2011 decision that changed a critical part of university electoral law. In both the previous and new policies, school administrators control a third (33%) of the vote, faculty control another third, and the student body controls the final third. Under the old law, the final percentages for each candidate were calculated out of the total number of eligible voters. By virtue of the university’s structure, there is always a low voter turnout in the student body because eligible voters include literally all enrolled students, not only those who take classes or frequent the campus. In other words, even if all the students who appeared to vote all voted for one candidate, that candidate’s percentage of the student vote would still be significantly diminished because of the inevitable greater number of students who missed the election. Secondly, outgoing Director Socorro had chosen a successor other than her sister: Carlos Eduardo Pinho Romeiro, then the Coordinator of Undergraduate Studies. His opponent was Moisés Diniz de Almeida, a History professor at the campus who was extremely popular with the student body. For almost two months, Moisés’ supporters manned a tent set up outside the main campus building, passing out literature and stickers daily, hosting open-mic performances, and maintaining a constant presence of fliers, posters, and banners around the university. 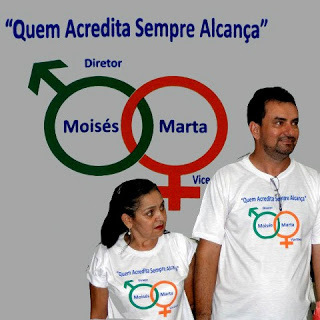 Around every corner was a Moisés campaign logo. Still, his team was anxious: even with the new electoral law, each administrator and faculty vote received more “weight” than each student vote because the student population, so much larger than either of the two former groups, was nevertheless given an equal percentage value. In other words, one administrator’s vote could overpower dozens of student votes for a different candidate. Moreover, about half the administrator positions are appointed by the Director in power, so those individuals would be highly likely to vote for the incumbent as a job retention strategy. This election characterizes so well the pattern that democratization has taken in Brazil. In some ways, the country is exceptionally transparent and formulaic, favoring public campaigning, painstaking inclusion of all parties, and neat math combined with the most sophisticated voting technology in the world. In others, it contradictorily manages to maintain inequality in the face of such transparency, creating pockets of extremely concentrated power. Ultimately, given these contradictions, the government fails to completely eradicate the major faults in its own system, and the voters—still faced with vast disparities in education and income inequality—struggle to utilize effectively the rights and powers that their government has provided. On the one hand, I compared UPE’s election to that of my alma mater, Brown, which recently took on a new President. The decision rests with the University Corporation, which also seeks to include input from students, faculty, staff, and all other relevant parties. The search and decision process was long and well-communicated to the public, but ultimately the final vote was taken in a closed room without any of those relevant parties present. Brown, of course, is a private institution, but even public universities like the University of California system employ a “selection committee” rather than the democratic process to find and approve a new President. The UPE system, by comparison, seemed refreshingly clear, giving each student and professor and administrator a vote and allowing the candidates to campaign freely. Other bureaucratic policies in Brazil are similarly transparent: federal university positions, from administrative staff to professors, are often filled by competition, in which the candidate with the highest score on a government exam gets the position. Theoretically, this reduces unfair judgments of appearance and eliminates the hiring of less qualified friends or family members. Voting for every election occurs electronically even in the smallest cities, and results are posted that same day without any uncertainties or recounts: the very close results of the Petrolina mayoral election were posted online only a few hours after the polls closed. Extending transparency beyond electoral processes, an online tool allows anyone to investigate the spending of public money and to look up the salaries of government workers from the kitchen staff to the President. Yet this regulated transparency doesn’t necessarily extend to all arenas, or when it does, the country’s democratic system can be rigid—in particular when maintaining its inequality. In the UPE election, everyone got a vote, but not everyone’s vote held the same weight, and in fact even the most basic administrative position was valued at many dozens of times that of an enrolled student. Until last month, contracted domestic workers were not considered full workers under the federal law, and thus labor rights did not apply to them. Despite such a fair election system, ex-President Lula has occasionally seemed on the edge of trying, like Socorro did at UPE, to fill his position with a like-minded successor when his term ran out, then regain the office when he is again legally able. Furthermore, even despite significant efforts at transparency, the system sometimes either fails to provide equal access or isn’t utilized effectively. At all levels of government, a seemingly impenetrable bureaucracy prevents less privileged individuals from gaining access to its benefits or processes, while those with friends in high places find a smoother or alternate path. Perhaps more than anything, the inequality of government employee salaries appears the most farcical. In a system so clearly calculated, and despite the online database of federal salaries, somehow certain government workers get away with absurdly high paychecks. Even the New York Times reported at length earlier this year on the inequality of some government salaries, citing among other examples a parking valet in São Paulo who earned more than ten times the standard salary of a schoolteacher. This incongruity perhaps shows, more than anything, the gulf between theory, that publishing government salaries will achieve transparency, and practice, that this transparency will itself effect some change. Soon before the Petrolina election, the city councilmen and women openly voted to double their own salaries. Most were reelected a few weeks later. In this sense, the voters are still catching up to some of the visionary ideas of their better leaders, and those leaders have yet to successfully tackle some of the largest obstacles to true democracy: effective education and healthcare systems, wealth inequality, and information access. At the end, though, democracy is marching forward in the country. Dilma’s pursuit of the mensalão perpetrators and other corruption cases, while slow-moving and perhaps diminutive compared to the extent of the corruption problem, shows initiative on a federal level. She also has proven herself to be above whatever personal hopes Lula had to return to office; despite being his chosen successor, she has made an effort not to let that limit her. Through mostly government programs, the Brazilian people are becoming more educated and less impoverished, allowing them to discerningly utilize the information and rights made available to them. And when all the votes were counted, History professor Moisés did in fact become the new Director of UPE’s Petrolina campus, breaking 16 years of dynastic rule in a flawed, but expanding, democratic system. So the evil dinasty was overcame after all! Good triumphs once more. Jokes aside, nice text Chels, you spoke very objectively.